It turns out that the incidence of cardiac arrest in pregnancy may be as high as 1 in 20,000 (the incidence of sudden death in young athletes is on the order of 1 in 200,000). (2) Therefore, every physician and nurse who may encounter a pregnant patient in cardiac arrest, should be able to render her the best treatment possible. Establish intravenous (IV) access above the diaphragm. Consider reversible causes of critical illness and treat conditions that may contribute to clinical deterioration as early as possible. If left-lateral tilt is used to improve maternal hemodynamics during cardiac arrest, the degree of tilt should be maximized. However, at a tilt ≥30° the patient may slide or roll off the inclined plane,106 so this degree of tilt may not be practical during resuscitation. Although important, the degree of tilt is difficult to estimate reliably; 1 study reported that the degree of table tilt is often overestimated.110 Using a fixed, hard wedge of a predetermined angle may help. Therefore, to relieve aortocaval compression during chest compressions and optimize the quality of CPR, it is reasonable to perform manual left uterine displacement in the supine position first (Class IIa, LOE C). 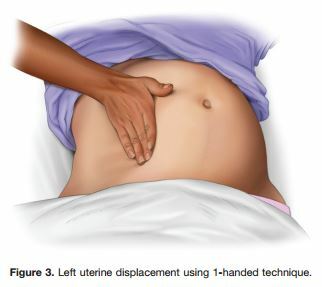 Left uterine displacement can be performed from either the patient’s left side with the 2-handed technique (Figure 2) or the patient’s right side with the 1-handed technique (Figure 3), depending on the positioning of the resuscitation team. 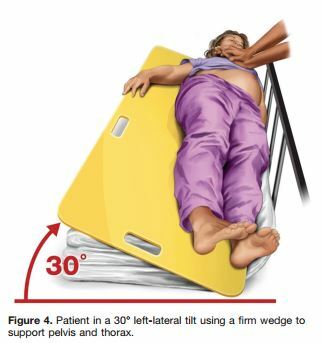 If this technique is unsuccessful, and an appropriate wedge is readily available, then providers may consider placing the patient in a left-lateral tilt of 27° to 30°,106 using a firm wedge to support the pelvis and thorax (Figure 4) (Class IIb, LOE C). Airway management is more difficult during pregnancy (see “ACLS Modifications: Airway,” below), and placing the patient in a tilt may increase the difficulty. In addition, altered airway anatomy increases the risks of aspiration and rapid desaturation. Therefore, optimal use of bag-mask ventilation and suctioning, while preparing for advanced airway placement (see “ACLS Modifications”) is critical. Chest compressions should be performed slightly higher on the sternum than normally recommended to adjust for the elevation of the diaphragm and abdominal contents caused by the gravid uterus. Use of an AED on a pregnant victim has not been studied but is reasonable. 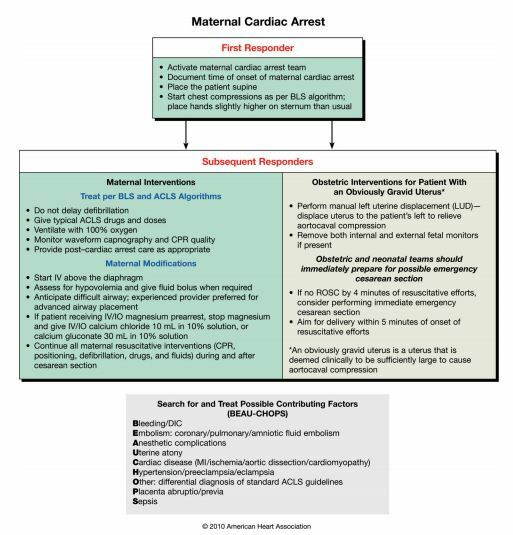 There should be no delay in delivering usual treatments during the management of cardiac arrest in pregnancy. There is significant literature recognizing the issue of failed intubation in obstetric anesthesia as a major cause of maternal morbidity and mortality.117,118 All providers involved in a resuscitation attempt should be aware of the increased risk for pregnancy-related complications in airway management. Intubation with an endotracheal tube or supraglottic airway should be performed only by experienced providers if possible. There is no evidence, however, that current medications or doses should be altered during management of cardiac arrest in pregnancy; therefore, current recommended drug dosages for use in resuscitation of adults should also be used in resuscitation of the pregnant patient. Resuscitation team leaders should activate the protocol for an emergency cesarean delivery as soon as cardiac arrest is identified in a pregnant woman with an obviously gravid uterus. By the time the physician is ready to deliver the baby, standard ACLS should be underway and immediately reversible causes of cardiac arrest should be ruled out. When the gravid uterus is large enough to cause maternal hemodynamic changes due to aortocaval compression, emergency cesarean section should be considered, regardless of fetal viability. Why Perform an Emergency Cesarean Section in Cardiac Arrest? The 5-minute window that providers have to determine if cardiac arrest can be reversed by BLS and ACLS was first described in 1986 and has been perpetuated in specialty guidelines.143,166 The rescue team is not required to wait 5 minutes before initiating emergency hysterotomy, and there are circumstances that support an earlier start.157 For instance, in an obvious nonsurvivable injury,166,167–169 when the maternal prognosis is grave and resuscitative efforts appear futile, moving straight to an emergency cesarean section may be appropriate, especially if the fetus is viable. (1) Part 12: Cardiac Arrest in Special Situations: 2010 American Heart Association Guidelines for Cardiopulmonary Resuscitation and Emergency Cardiovascular Care, Circulation. 2010;122:S829-S861. [Full Text HTML] [Full Text PDF] Cardiac arrest associated with pregnancy is covered in section 12.3 of the document (S833 to S838). (2) Advanced Life Support in Obstetrics (ALSO) Course Manual, August 2010. (3) The American Heart Association 2010 Guidelines for the Management of Cardiac Arrest in Pregnancy: Consensus Recommendations on Implementation Strategies, J Obstet Gynaecol Can 2011;33(8):858–863. (5) LMAs and Cesarean Section. YouTube, March 13, 2014, 26:29. Richard Smiley, MD PhD. This video discusses LMA in cesarean section patients not in cardiac arrest–clearly a very different scenario from ours. But this lecture is still worth reviewing. Dr. Smiley discusses three large case series of the use of LMA in cesarean section anesthesia from 12:45 to 18:15. Dr. Smiley summarizes his talk beginning at 24:55. This entry was posted in Advanced Cardiac Life Support, Advanced Life Support In Obstetrics, Emergency Medicine, Neonatal Resuscitation, Obstetrics and Gynecology. Bookmark the permalink.